It’s called development-supported agriculture, a more intimate version of community-supported agriculture – a farm-share program commonly known as CSA. In the planning process of a new neighborhood, a developer includes some form of food production – a farm, community garden, orchard, livestock operation, edible park – that is meant to draw in new buyers, increase values and stitch neighbors together. “These projects are becoming more and more mainstream,” said Ed McMahon, a fellow with the Urban Land Institute, who estimates more than 200 developments with an agricultural twist already exist nationwide. As the local food movement has taken hold across the country with a growth in farmers markets and a surge in organic food sales, suburban developers have taken notice. Now they’re leveraging the movement’s in vogue status to build neighborhoods around farms and, ultimately, to sell homes. In Fort Collins, Colorado, developers are currently constructing one of the country’s newest development-supported farms. At first blush, the Bucking Horse development looks like your average halfway-constructed subdivision. But look a bit closer and you’ll see a rustic red farm house and a big white barn enclosed by the plastic orange construction fencing. Kristin Kirkpatick, who leases space in Bucking Horse’s commercial area, says agriculture and food production are the big draws to the development. “When we show it, people are either like, ‘You guys are crazy, I don’t see the vision here at all,’ or they come and they’re like, ‘This is going to be amazing,’” said Kristin Kirkpatrick, who works for Bellisimo, Inc., the developer that purchased this 240-acre plot of land in 2010 to turn it into a neighborhood totally devoted to local food. Kirkpatrick is in charge of leasing at the Jessup Farm Artisan Village, the commercial space at Bucking Horse. Work is underway to rehab the historic barn, farm house, loafing shed, saddle shop and chicken coop. Plans for the Village include a farm-to-fork restaurant, wine maker, coffee roaster and yoga studio. When finished, Bucking Horse will support more than 1,000 households. Some families have already moved in. More townhouses and single family homes are currently under construction and condos are planned. Agriculture and food production are the big draws to Bucking Horse, Kirkpatrick said. The development has set aside land and is working on hiring its very own farmer. In its plans, the neighborhood will support a 3.6 acre CSA farm, a plaza designed for a farmers market, an educational center where homeowners can take canning classes. A subsidy from the homeowners’ association will likely support a small livestock operation with goats and chickens. 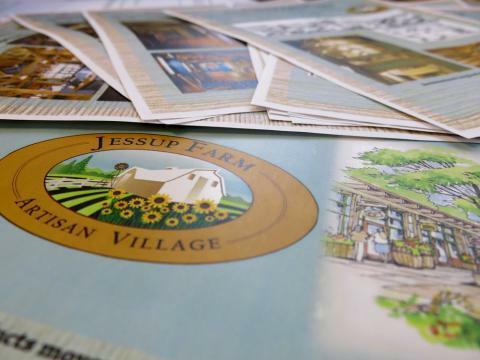 The plan is infused with the quaint, pastoral, even romantic, view of farming. In its plans, the neighborhood will support a 3.6 acre CSA farm, a plaza designed for a farmers market, an educational center where homeowners can take canning classes. As suburban sprawl has taken over across the country, farmland has been transformed into neighborhoods. In many cities, restrictive zoning pushed goats, chickens and tractors out of those new residential areas. Now though, that process is being reversed in some areas. With growing interest in farming as a community activity, municipalities are being forced to change their codes to bring those things back in. While the plans for Bucking Horse were being proposed, the development company realized some amenities bumped up against city zoning rules that ran contrary to the concept of urban agriculture. “We used to have residential separated from agriculture and now we’re seeing those uses combined,” said Lindsay Ex, environmental planner with the city of Fort Collins. Bucking Horse was being finalized at the same time city staff began to revisit some of the biggest obstacles to growing vegetables on a larger scale or raising livestock within city limits, Ex said. The combination of suburban development and specialty farms could bring in big money for developers. Subdivisions that include small-scale farms have sprung up in Illinois, Georgia, and Vermont. The potential for a piece of that new development has also given rise to new businesses. In traditional developments, the developer or homeowners’ association hires someone to run the golf course. Now, they’re hiring someone to run the community farm. Quint Redmond runs a company called Agriburbia, which both consults on new developments and operates farms within existing neighborhoods and school districts. This idea of farm-as-amenity is a great deal for your average small-time farmer, Redmond said. In development-supported agriculture projects, it ends up being the developer or homeowners association that puts in irrigation lines and makes big farm purchases, not the farmer. Not to mention the vegetable fields are completely surrounded by homes filled with people already interested in local food. More so than your average CSA, the market is primed and ready for a farmer to sell. “What happens is, the farmer may farm [the land], everybody gets to see it as they’re moving into the subdivision over time, and then there’s a real market for that farmer,” Redmond said. The marketing of these new neighborhoods appears to be working, at least at Bucking Horse in Fort Collins. 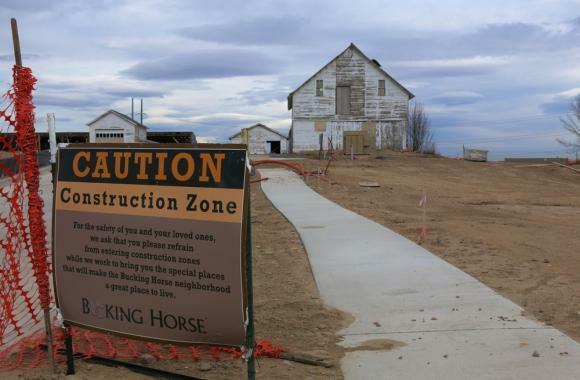 Bucking Horse’s developer says new single-family lots were snatched up within days of going on the market. Values of existing homes have jumped 25 percent since the agricultural amenities started construction. And they’re selling the new lots at 20 to 25 percent above nearby neighborhoods. “Once we saw this and the plans they had for it, we were really sold on the lifestyle, I would say,” said Lindley Greene, who moved to Bucking Horse in March with her husband and two young sons. The agricultural amenities weren’t the sole reason for the move, but certainly sweetened the deal, Greene said. Once the neighborhood farm is up and running, Greene said, she’ll be volunteering to get her hands dirty. And if enough of these developments take off, expect suburban soccer mom to become synonymous with backyard farmers. Within the local food movement, the community supported agriculture, or CSA, model is praised. It’s considered one of the best ways to restore a connection to the foods we eat. Consumers buy a share of a farmer’s produce up front as a shareholder and then reap the rewards at harvest time. But as Harvest Public Media’s Luke Runyon reports running a CSA can bring some tricky business decisions. Community gardens dole out small plots of land and encourage people with limited access to fresh produce to grow their own. Now, there’s a new twist on that model springing up across the country: edible food forests.